By the middle of the afternoon I was in a quandary. Stay for the next two symposium speakers and miss the chance to look around? Or go out for a short walk? It should be possible to get back in time to hear the final presentation. I was taking part in the “Making/Crafting/Designing” design theory symposium held last week at the Akademie Schloss Solitude near Stuttgart in Germany. Castle Solitude, an 18th-century hunting lodge in the form of a spectacular rococo palace, lives up to its name. It’s at the top of a hill miles from anywhere. The area called out to be explored and I know from similar brief trips that it’s possible to return home with the frustrating feeling that you haven’t understood where you have been staying. So I left the annex where the symposium was taking place and went out to admire the nearby palace. From an arched passageway that runs through the building at ground level, you can look down the hill through an opening in the trees to see the town of Weilimdorf far below. Unable to resist the opportunity, I started down the hill, turned to the left and entered the forest, following the path that wound through the trees. 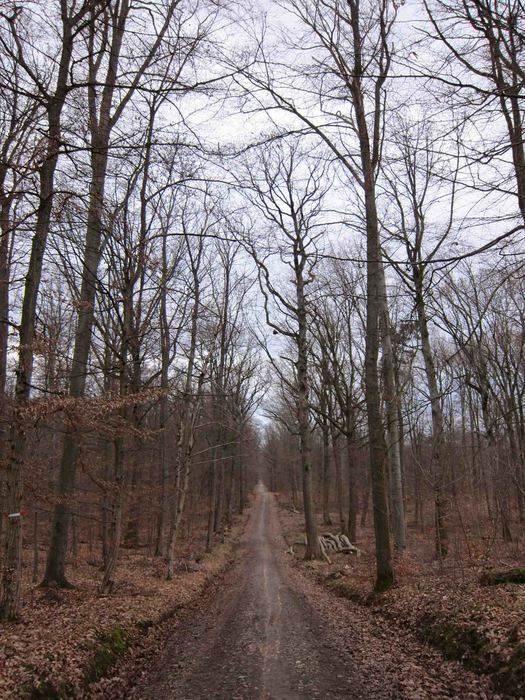 If you know the work of the German Romantic painter Caspar David Friedrich, it’s almost impossible to contemplate Germanic woodlands without thinking of pictures such as The Chasseur in the Forest (1813/14) where a lone hunter — the very image of solitude — stands on the threshold of fathomlessly dense trees. 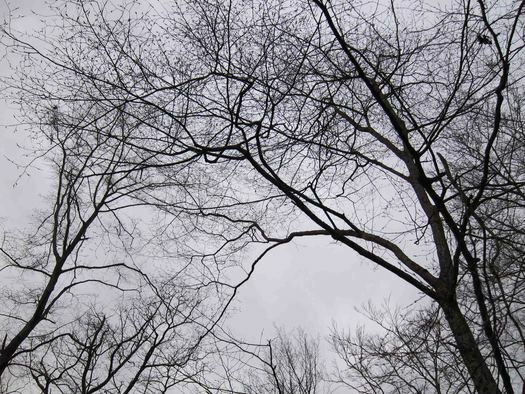 I had my camera with me and took some pictures of the leafless treetops fusing in the twilight to form ecstatic webs, like blood vessels, of interlinking branches and twigs. Again, I found myself thinking of Friedrich, whose gaunt and twisted tree shapes are some of the most eloquent and affecting in the history of painting. Once you are on a path, it can be hard to stop walking; the further you go, the less appealing the idea of turning around and retracing your steps becomes. 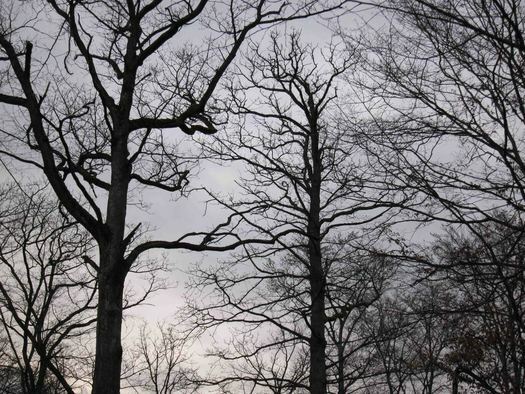 The deep solitude of the woods — I was phoneless — was enormously welcoming. The more interconnected we grow, the more we seem to forget and perhaps even fear the experience of being completely alone. There were other paths and trails leading off through the woods. It was obvious now that I wouldn’t be back in time for the final lecture. The light was beginning to fail and I had already come a long way from the Schloss Solitude. I hoped my hunch was right that eventually the descending path I had taken would curve round to join the straight path I had seen from the castle above. I was beginning to think I might be lost when I saw the chair. 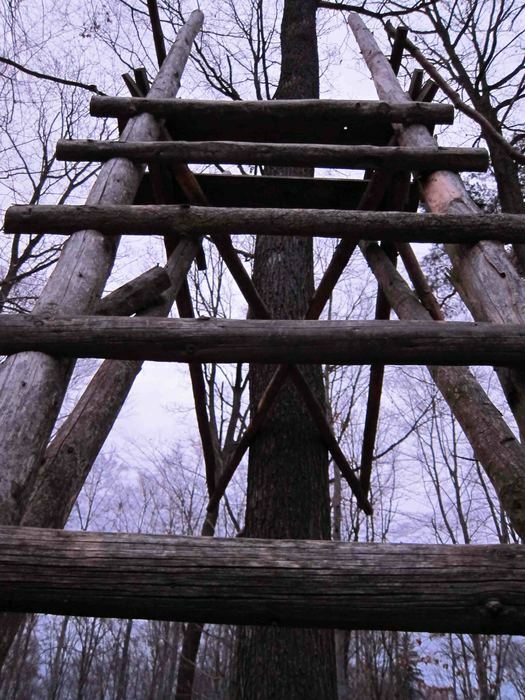 It was perhaps 50 feet away from the path, in the woods, a structure around 12 feet tall, built from wooden poles, leaning against a tree. I made my way across the forest floor towards it. 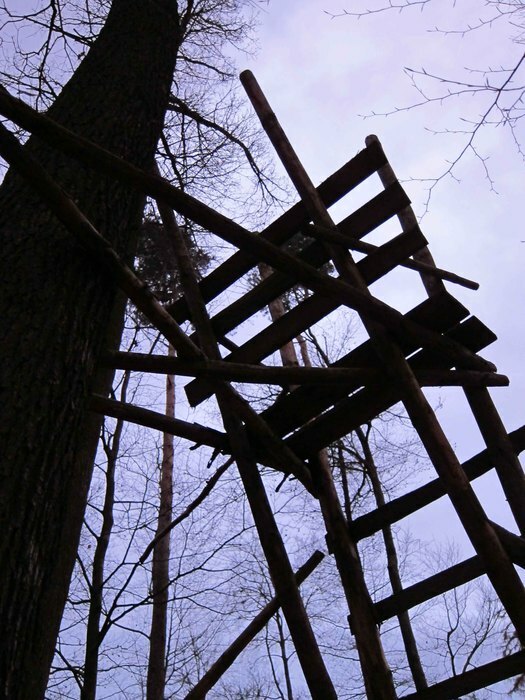 A broad ladder with ten thick rungs led to the seat above, fashioned from planks. What was this thing? The idle amusement of some loggers? An art piece by some former resident of the academy? The structure recalled collages made by the Danish artist Anne Harild, which I wrote about a while back. Gingerly testing each rung, I climbed up into it and sat back angled towards the sky like a pilot of the woodland grove. The chair overlooked a clearing in which a few big logs lay scattered. There was no obvious reason to position it here. The seat creaked and moved alarmingly under my weight. Was it secure? With darkness coming, this wasn’t the time to fall and break an ankle or worse. I thought of the wooden chair in Bill Viola’s Reasons for Knocking at an Empty House — try it out if you get the chance — and had a weird idea that occupying this curiously ceremonial platform, where I couldn’t help feeling like an interloper, might send a signal, activate a prearranged response and cause some unexpected or unwanted event to occur. Nothing happened. There was only the quiet of the woods. Then three walkers passed by on the distant path, appearing not to notice me perched in the air. This mysterious structure for elevating a solitary sitter into the trees, an aid to private contemplation discovered only because I had kept on walking, seemed at least for that moment to embody the spirit of a place designed 250 years ago around the ideal of solitude. Later, when I mentioned the chair to my hosts, they knew nothing about it and made no suggestions as to what it was. I have since learned — only to a non-gun-owning urbanite could it not be obvious — that chairs like this have a strictly utilitarian purpose. 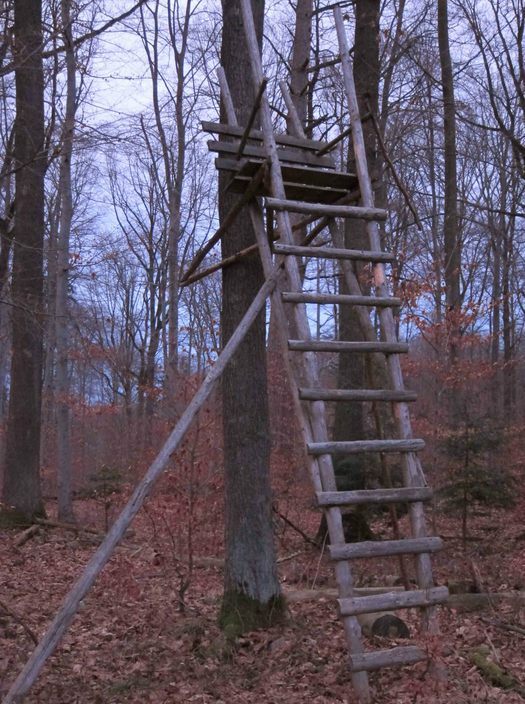 I had stumbled on an old hunting ladder, probably disused (one of the support poles had fallen away), its construction a variation on an established pattern. One can buy sleek aluminium versions of the same thing. I’m not sorry that I didn’t know the chair’s true purpose as I found my way to the path that led uphill to the Schloss Solitude. I prefer the idea of an elevated chair designed to encourage personal reflection. In the dark, by the flash from my camera, I read on a sign that this tree-lined thoroughfare, about eight miles long, is called Solitudeallee. I began my slow climb up Solitude Avenue back to the symposium. 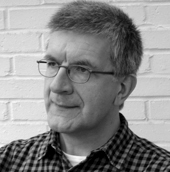 Thanks Rick; I really like the idea that products & structures can be "misread" like texts. 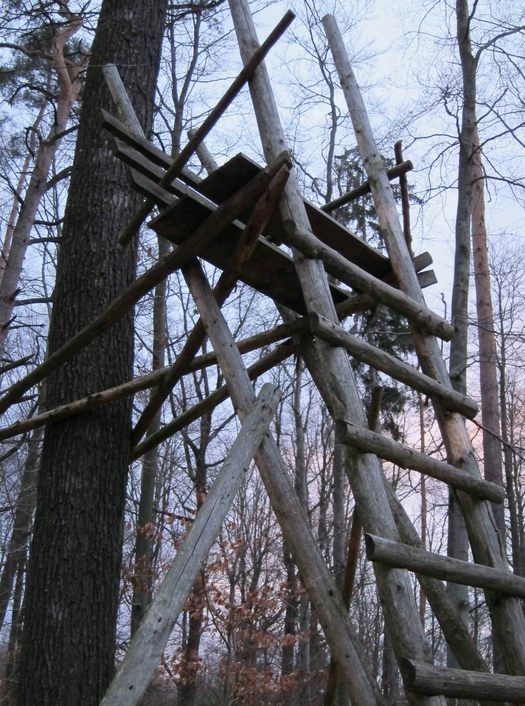 It is most likely a tree stand or deer tower but it also has some aesthetic and engineering qualities that you don't usually see in homemade stands (image search "homemade tree stands"). Even though I know something about tree stands I had to do a double take. I find it rather poetic, the name of the school, the path and the chair as an experience that was waiting for you, but could have been easily missed. It probably made sense later, passed the initial surprise and unfamiliarity. Many times we miss the point of a place by deciding not to bother, although the clues are there for us to take note, and perhaps make it unforgettable. I too came across a series of these chairs recently. Apparently the less obvious advantage of them (the obvious being vantage) is that the line of sight is pointing downward so if a hunter misses a target the bullet hits the ground and not passers by. How very thoughtful. Thanks for the comments. On "misreading" objects, the Surrealists would frequent the flea markets looking for old, perhaps outmoded objects of uncertain purpose that could take on a new imaginary life. "Solitude is a strong position. The position to refuse." Right as I saw the Picture, I knew what it was, because I use things like that frequenly. But nevertheless, ist an unbelievable poetic tale about something so common.